The Do’s; If you suffer an injury such as a sprain, strain, muscle pull, or tear, immediate first aid treatment can prevent complications and help you heal faster. How we manage an injury, be it a sprain or a fracture in the acute or the first 72 hours plays a major role in the recovery time. The commonly used practices are rubbing, pulling, and applying heat to the injured area. This unfortunately, doesn’t hasten the recovery. The following are the scientifically proven methods on how to treat an acute injury and are widely accepted across the globe. PRICE : Price stands for protection, rest, ice, compression & elevation. Using these immediate first aid measures is believed to relieve pain, limit swelling and protect the injured soft tissue. 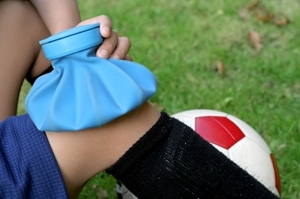 When an injury occurs, damaged soft tissue may bruise, swell or bleed (externally or internally) and become inflamed. Healing occurs as the damaged tissue is replaced by collagen, perhaps better known as scar tissue. In most cases the tissue needs complete repair before you should return to sports. Protection: When injured, you have to protect the injured site from further injury. This can be done by means of splints, padding, Braces or other orthotic supports. For example, a suspected collar bone fracture can be protected by supporting the upper limb with a sling; an ankle sprain can be protected from further injury through taping or ankle braces. Avoid putting weight on the injured part, get help moving to a safe area off the field. Rest : You have rest the affected joint / muscle or ligament to allow it to heal. Inadequate rest can cause instability and repetitive injury. The area to be rested can also be put in a POP slab, or in a cast to reduce micro movements, which can hamper healing, as in the case of Fracture, it can also relieve pain. Rest does not mean Bed rest. It is a relative rest, that is you rest only the affected area. Example : Some one with a shoulder injury can continue to cycle/walk and keep fit; similarly a person with a ligament injury of the knee can stay fit by using rowing / walking in the pool or doing some upper body strength training. Just make sure you do not do things that cause pain or further damage in the injured area. Ice: When injured, there is an inflammatory response, which is natural to occur, A localized acute inflammatory response triggers vascular changes in the injured area, recruits pathogen-fighting neutrophils, and begins the process of developing a new adaptive immune response. In lay man terms we call it as a swelling. While we need the blood to rush to the injured site, we do not want too much of it, which can hamper the healing process. Hence ICE the injured site. By icing we cool down the area and limit the swelling and moreover ice is the cheapest and easily available pain killer on earth, with negligible side effects. This is the magic pill administered in the sports field, where the athlete jumps up to resume their game. A good rule is to apply cold compresses for 15 to 20 minutes repeated every 2 hours during the day. You will not ice, if there is an open wound. Compression : Compression is primarily applied to stop bleeding and to reduce/control the swelling of the injured area. Crepe bandages or compression bandages are applied in distal to proximal (down up) in a figure of 8 or in parallel form to the injured segment. Although some swelling is inevitable, too much swelling results in significant loss of function, excessive pain and eventual slowing of blood flow through vessel restriction. An elastic bandage, rather than a firm plastic bandage (such as zinc-oxide tape) is required. Usage of a tight, non-elastic bandage will result in reduction of adequate blood flow. The fit should be snug so as to not move freely, but still allow expansion for when muscles contract and fill with blood. Elevation: Elevation again is used to contain swelling. Elevation: aims to reduce swelling by increasing venous return of blood to the systemic circulation. This will not only result in less swelling, but also aid in waste product removal from the area. The basic principle is to elevate the affected upper or lower limb above the level of the heart and against gravity. For example, if you injure an ankle, try lying on your bed with your foot propped on one or two pillows. This simple principle helps to reduce bleeding and swelling. Extensively used in sports clinics and in hospital settings, following a trauma or surgery. “For wounds to heal we need controlled inflammation, not too much, and not too little. At present, the PRICE treatment approach is still being recommended by most experts.